Sign in to register to receive emails with product information. Immunohistochemistry (IHC) is a technique used to analyze protein expression in the context of tissue morphology. This article describes an IHC protocol optimized by scientists at Cell Signaling Technology, for use with our antibodies, that you can replicate to obtain the best results in your experiments. 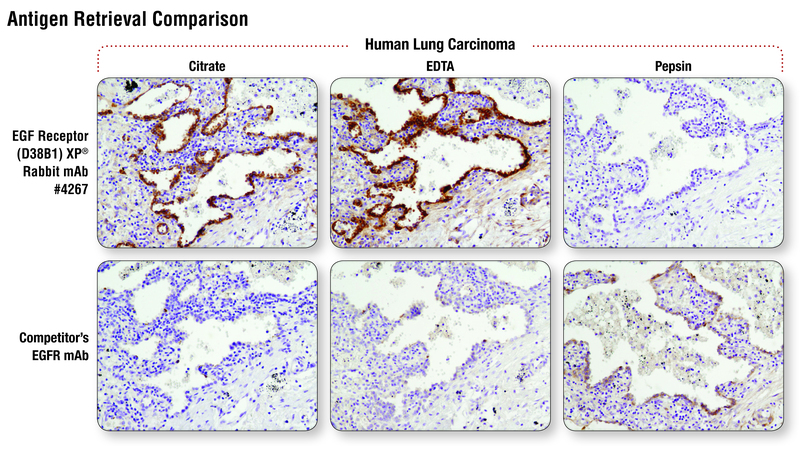 Immunohistochemistry (IHC) is a technique used to analyze protein expression in the context of tissue morphology. It exploits the specific binding of an antibody to its target epitopein combination with a chromogenic or fluorescent readout. Cell Signaling Technology (CST) antibodies validated for IHC have been developed in-house and CST scientists have determined the optimal conditions for the use of each antibody in IHC. The IHC protocol optimized for paraffin-embedded samples is detailed in this article so that you can replicate the procedure and obtain reproducible and reliable results. The main steps of this protocol are reagent and sample preparation, deparaffinization/rehydration, antigen unmasking (also called epitope or antigen retrieval), staining, dehydration, and coverslip mounting. Since all CST™ antibodies have been validated in-house using specific protocols, we strongly recommend following the protocol provided with each antibody. Some common areas where troubleshooting may be required are also discussed. IHC is a commonly used technique to monitor protein expression and localization in the context of tissue morphology. It uses antibodies to detect and analyze protein expression while maintaining the composition, cellular characteristics, and structure of native tissue. Chemical fixation locks into place molecular interactions within and between cells. Tissue samples may be embedded in paraffin wax or frozen before being cut into thin slices and mounted onto slides for analysis. Tissue collection, preservation, and fixation can vary greatly depending on the sample or the target of interest. IHC identifies the presence and pattern of a protein's expression in a biological sample through specific antibody binding. The precise binding that occurs between an antibody and its epitope allows detection of highly specific amino acid sequences within a protein, targeting defined regions, domains, or cleavage products. Antibodies can also detect specific post-translational modifications (PTM) on a protein. The sample must be preserved and hardened to retain form and structure so that thin sections can be cut. An important choice to be made is whether to carry out IHC on formalin-fixed, paraffin-embedded samples (IHC-P) or on fresh frozen samples (IHC-F). IHC-P offers superior tissue/cell morphology, but antigenicity is potentially compromised by the fixation required for IHC-P. The majority of CST antibodies that have been validated for IHC use IHC-P, so this video will focus on the protocol for IHC-P only. For our IHC-F protocol, please visit www.cellsignal.com/protocolguide. Protein cross-links are formed by formalin fixation, which can mask the antigenic site recognized by the antibody. The process by which epitopes are unmasked and made accessible to primary antibodies is known as antigen unmasking, epitope unmasking, or antigen retrieval. This can be carried out using heat with certain buffers, or enzymatic digestion by trypsin, pepsin, or another protease. For heat induced antigen unmasking, buffer choices include sodium citrate and EDTA, and the method of heating includes using a microwave, pressure cooker, or a water bath. Most CST™ antibodies have been optimized using a microwave and sodium citrate buffer. At CST, scientists specializing in IHC test a large number of antibodies, but approve only those best suited for IHC. Our scientists confront the challenges of tissue fixation/processing and antigen unmasking to determine the optimal conditions for use of each antibody that is validated for IHC. In addition, our scientists have developed IHC reagents to support enhanced antigen detection and improved efficiency of IHC protocols. 1. Preparation of Solutions and Reagents. Wash buffer. 10X Tris Buffered Saline with Tween® 20 (TBST, #9997). To prepare 1 L of 1X TBST: add 100 ml 10X TBST to 900 ml dH2O; mix. Antibody diluent options (a, b, or c). Note, CST™ antibodies usually require option a—refer to product datasheet for specific antibody requirements. TBST/5% normal goat serum: To 4.75 ml 1X TBST, add 250 µl Normal Goat Serum (#5425). PBST/5% normal goat serum: To 4.75 ml 1X PBST, add 250 µl Normal Goat Serum (#5425). Antigen unmasking options (a, b, c, or d). Note, CST™ antibodies usually require option a—refer to product datasheet for specific antibody requirements. Citrate. 10 mM Sodium Citrate Buffer: To prepare 1 L, add 2.94 g sodium citrate trisodium salt dihydrate (C6H5Na3O7 • 2H2O) to 1 L dH2O. Adjust to pH 6.0. EDTA. 1 mM EDTA. To prepare 1 L, add 0.372 g EDTA (C10H14N2O8Na2 • 2H2O) to 1 L dH2O. Adjust to pH 8.0. TE. 10 mM Tris/1 mM EDTA, pH 9.0: To prepare 1 L, add 1.21 g Tris base (C4H11NO3) and 0.372 g EDTA (C10H14N2O8Na2 • 2H2O) to 950 ml dH2O. Adjust pH to 9.0, then adjust volume to 1 L with dH2O. Pepsin. 1 mg/ml in Tris-HCl, pH 2.0. 3% hydrogen peroxide: To prepare 100 ml, add 10 ml 30% hydrogen peroxide to 90 ml H2O. Detection System: SignalStain® Boost IHC Detection Reagents (HRP, Mouse #8125; HRP Rabbit #8114). Place paraffin infiltrated tissue in a mold with a small volume of liquid paraffin. Cool briefly to immobilize the tissue. Place the base of a cassette on top of the mold. Fill with liquid paraffin, and then cool. Cut thin slices (4-6 μm) on a microtome, and float sections in a water bath. Mount sections on to charged slides and dry overnight. Using charged slides helps the section to adhere to the slide. To perform antibody staining, paraffin wax must be removed from the sample and the sample must be rehydrated. NOTE: Do not allow slides to dry at any time during this procedure as this can lead to inconsistent staining. To remove paraffin wax, place sections in three containers of xylene for 5 minutes each. Fresh xylene should be used as incomplete deparaffinization can also lead to inconsistent staining. To start rehydration, place sections in two containers of 100% ethanol for 10 minutes each. Place sections in two containers of 95% ethanol for 10 minutes each. To complete the rehydration process, wash sections two times in dH2O for 5 minutes each. Before antibody staining can be performed the cross-links formed by formalin fixation must be removed. NOTE: Consult product datasheet for antibody-specific recommendation for the unmasking solution. For Citrate: Bring slides to a boil in 10 mM sodium citrate buffer, pH 6.0; maintain at just below boiling temperature for 10 minutes. Cool slides on bench top for 30 minutes. To heat sections use a microwave. (For some CST antibodies the use of an alternative method to heat sections, such as a pressure cooker, is recommended.) It is important not to over or under heat samples as this can cause inconsistent staining results. Since equipment differs, the heating protocol must be optimized for each laboratory's make and model of microwave: this can be done by performing a trial run using blank slides (step 4.1.2). Heat slides until the buffer starts to boil. Adjust the power setting of the microwave to 30%, for example. Heat for 10 minutes and observe the vessel. A vigorous boil should be avoided. If a rapid boil is reached, remove the slides and repeat the optimization with fresh, room temperature buffer. Reduce the power to 20% instead of 30% and observe. Once the heating protocol has been optimized it should be recorded and always performed the same way. For example, if the heating protocol is optimized with 24 slides, then 24 slides should always be used (even if blank slides need to be used). For EDTA: Bring slides to a boil in 1 mM EDTA, pH 8.0 (See 4.1.1 and 4.1.2); follow with 15 minutes at a sub-boiling temperature. No cooling is necessary. For TE: Bring slides to a boil in 10 mM Tris/1 mM EDTA, pH 9.0 (See 4.1.1 and 4.1.2); maintain at a sub-boiling temperature for 18 minutes. Cool at room temperature for 30 minutes. For Pepsin: Digest for 10 minutes at 37 ºC. This protocol is for chromogenic staining. Immunofluorescent staining can also be performed if desired. NOTE: Consult product datasheet for recommended antibody diluent. To quench endogenous peroxidase activity in samples, which may lead to high background staining, place sections in 3% hydrogen peroxide for 10 minutes. Use a hydrophobic pen to draw a large circle around the sample, taking care not to touch the sample. This creates a hydrophobic boundary so that a smaller volume of antibody solution can be used and, if desired, allows multiple sections on one slide to be stained with different antibodies. Remove blocking solution and add 100–400 µl primary antibody diluted in recommended antibody diluent to each section. Incubate overnight at 4 °C in a humidified chamber. Our antibodies have been validated based on an overnight incubation. For shorter incubations some additional optimization may be required. Equilibrate SignalStain® Boost Detection Reagent to room temperature. Cover section with 1–3 drops SignalStain® Boost Detection Reagent as needed. Incubate in a humidified chamber for 30 minutes at room temperature. Apply 100–400 µl SignalStain® DAB to each section and monitor closely. 1–10 minutes generally provides an acceptable staining intensity. If desired, counterstain sections with hematoxylin. This stains the cell nuclei blue, which provides a contrast to the brown color of the DAB chromogen for better visualization of tissue morphology. SignalStain® DAB Chromogen is compatible with either aqueous or nonaqueous mounting medium. If choosing nonaqueous, the sections must be dehydrated again prior to coverslip mounting. Place sections in two containers of 95% ethanol for 10 seconds each. Place sections in two containers of 100% ethanol for 10 seconds each. Place sections in two containers of xylene for 10 seconds each. Mount sections with coverslips using mounting medium, being careful to avoid introducing air bubbles. Allow mounting medium to set and view slides on a microscope. Figure 2. Sections of human lung carcinoma were stained with Phospho-Stat3 (Tyr705) (D3A7) XP® Rabbit mAb #9145. Antigen unmasking was performed using a water bath (A), a microwave (B), or a pressure cooker (C). In this example, a clear increase in antibody signal is seen using the microwave and pressure cooker. For some antibodies, signal may be enhanced using a pressure cooker. In general we do not recommend the water bath method for CST antibodies. Figure 3. Sections from human breast carcinoma were stained using Phospho-Akt (Ser473) (D9E) XP® Rabbit mAb #4060 (A) or HCC827 xenograft sections were stained with Phospho-EGF Receptor (Tyr1173) (53A5) Rabbit mAb #4407 (B). The antibodies were diluted with either SignalStain® Antibody Diluent #8112 (left) or TBST-5% NGS (right). 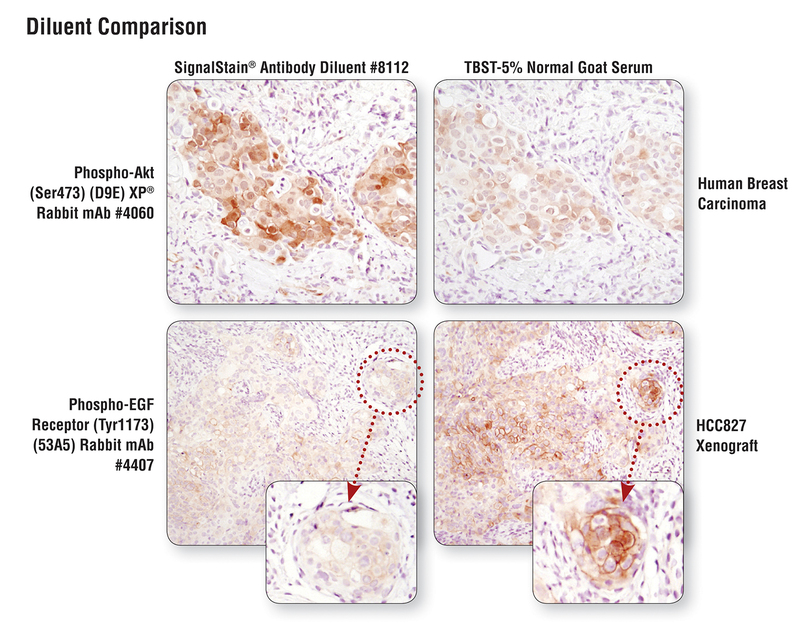 #4060 gives a better signal with SignalStain® antibody diluent, whereas #4407 shows better staining with TBST-5% NGS demonstrating that diluent choice is antibody dependent. Figure 4. Prostate carcinoma sections were stained for 1 hour (A) or overnight (B) with Phospho-4E-BP1 (Thr37/46) (236B4) Rabbit mAb #2855. Increased signal can clearly be seen with overnight incubation of antibody compared to the signal seen with a 1 hour incubation. For this reason, we recommend overnight staining (some antibodies may work well with shorter incubation times, though optimization may be necessary in order to obtain an ideal signal). IHC experimental problems are frequently resolved by adjusting relatively few variables. General protocol adjustments to key steps, such as antigen retrieval, can often resolve these common problems. It is important to follow CST optimized protocols for each antibody. For a detailed IHC troubleshooting guide refer to our Protocol and Troubleshooting Guide (www.cellsignal.com/protocolguide). Below is a brief outline of areas where problems can occur. Little or no staining can be caused by several factors. For example, allowing the sample to dry out at any point during the protocol or inadequate deparaffinization can cause inconsistent staining. Take care to use fresh xylene in step 3.1 to remove paraffin completely from the sample. Incorrect unmasking/retrieval buffer or protocol can also lead to low signal in your IHC. Figure 1 demonstrates the importance of choosing the correct antigen retrieval buffer, or heat-induced versus enzymatic retrieval. In addition to the buffer used for heat-induced antigen retrieval, the mechanism of heating is also critical. CST recommends using a microwave or pressure cooker to heat the samples (Figure 2). For successful staining, samples should not be over or under heated. For CST antibodies that use citrate buffer for antigen retrieval, as demonstrated in step 4.1 of this protocol, samples should be brought to a boil and then kept at just under boiling temperature for 10 minutes. See step 4.1.1 and 4.1.2 for optimization of the heating protocol. The wrong choice of antibody dilution/diluent can also lead to low signal in IHC. Diluent choice is antibody dependent. For example, as demonstrated in Figure 3, CST antibody Phospho-Akt (Ser473) (D9E) XP® Rabbit mAb #4060 works best with SignalStain® antibody diluent, whereas Phospho-EGF Receptor (Tyr1173) (53A5) Rabbit mAb #4407 works better with TBST-5% NGS. Lastly, incubation time is important for optimal IHC staining (Figure 4). Increased signal can clearly be seen with overnight incubation of antibody compared to the signal seen with a 1 hour incubation. For this reason, we recommend overnight staining (some antibodies may work well with shorter incubation times, though optimization will likely be necessary in order to obtain an ideal signal). High background staining can be caused by inadequate deparaffinization. Take care to use fresh xylene in step 3.1 to remove paraffin completely from the sample. If using an HRP-based detection system, endogenous peroxidase activity can also cause high background staining. To quench endogenous peroxidase activity in samples, place sections in 3% hydrogen peroxide for 10 minutes (step 5.2). Inadequate blocking can lead to high background signal. It is important to block samples at room temperature for at least 1 hour in blocking solution containing serum from the same species as the secondary antibody that you are using (step 5.5). Incorrect antibody dilution/diluent choice and method of antigen retrieval can also cause high background signal. It is important to follow the antibody-specific protocol on the antibody datasheet. Secondary antibody cross-reactivity can lead to nonspecific/high background staining. It is important to use a secondary-only control to assess whether this is the case. Finally, insufficient washing of samples can lead to high background staining. It is critical to perform wash steps as directed in the protocol. It is good practice to employ positive and negative controls to ensure that the antibody and procedure are working as expected. Examples of controls that can be used include isotype control antibodies to rule out nonspecific antibody staining, using cells or tissues known to express or not express the protein of interest (for example, use mouse knock out model tissue/cells if they are available), or using paraffin-embedded cell pellet control slides (for a full list of the control slides available for CST antibodies see http://www.cellsignal.com/technologies/ihc_controls.html. This video should provide the information you need to perform IHC successfully using CST antibodies in your own lab. CST prides itself in providing you with exceptional customer service and support. Since all of our antibodies are produced in house, the same scientists who develop these reagents, as well as the IHC group who validated them, are available as technical resources for our customers. Please feel free to contact these scientists directly. As a company of scientists, we understand how important it is to work with antibodies that are specific and consistent from lot-to-lot. To ensure product performance, we validate all of our antibodies in-house in multiple research applications. If a product does not perform in your experiment as described on our website or datasheet, please contact your local CST office or nearest distributor (see below for contact information) within 12 months of product receipt. The same expert scientists who produced your antibody will guide you through a few simple troubleshooting steps and, if your issue is not resolved, we will replace the antibody at no cost to you, or provide you with a credit. For complete terms and conditions, please visit www.cellsignal.com/abguarantee. This sponsored video is Free Access.